As with most other things in my life, I wanted my Fitness Project to have a strong family component. 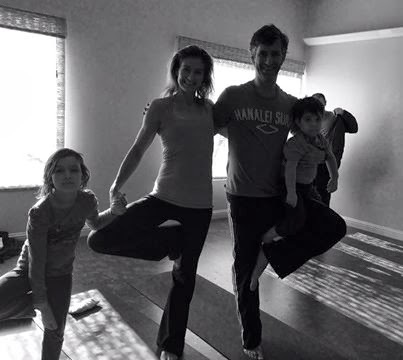 For my Yoga Month, the optimal way to do that was to attend a weekly family yoga class with my kids and, if he was available, my husband. So our Saturday morning routine transitioned to something like this: I go to a challenging flow-based class from 7:30 to 9 AM and then my husband arrives at the studio with the kids for the 9:15 to 10 AM family yoga class. Pretty sweet, huh? Most of you are probably no strangers to yoga, but you may not have ever attended a family yoga class or attempted to practice yoga with your children. The most accurate way I can describe the experience is as a litter of puppies. You, your children, and sometimes other people's children are giggling and laughing and rolling around and crawling over, under and all-over each other. Down dog becomes an obstacle course of tunnels, cat/cow spine awakening becomes "horsie", child's pose becomes a bench or a hill to climb, lunges are most certainly weight-bearing (of the 30+ pound, 2-YO variety of weight; sort of like a kettle ball - only not). All in all, hair tousled, body moved, belly laughed, skin to skin contact made, a few deep breaths managed and 45 minutes later as you lay there with an eye pillow placed on your eyes by your son and with your daughter massaging your feet with a scented lotion, you feel pretty darn good.